I love to grill. Becoming vegan actually made me love grilling things even more. 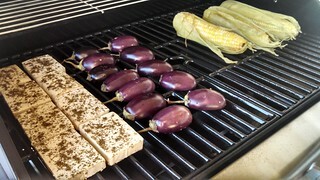 I’ve grilled all kinds of veggies, fruit, pizza, and even have made tea & wood smoked noodles with Kefir lime leaves. Yes, noodles, on a grill. What is shocking is that for the past several years I’ve been doing all this grilling on a piece of equipment never intended for the kind of heavy use I gave it. Don’t get me wrong, the Coleman Road Trip Grill LX is an awesome grill. Perfect for taking car-camping, tail-gating, and for picnics at the park. The last time I cleaned it a bit rusted right off, so it has kind of been time to move on. 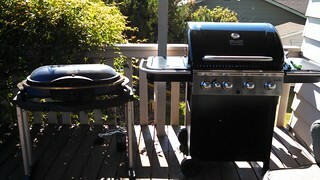 An unexpected windfall last month made up my mind to upgrade the grill just as summer really gets going in Portland. Given the amount of the windfall I couldn’t go crazy and get The Grill (something in the Weber line), but I could get a good, sturdy, serious upgrade that would let me grill All The Food at once, rather in waves as I’d been doing on the Coleman. I choose a Char-Broil Classic 4-Burner Gas Grill with Side Burner , which is a huge improvement, as you can see. On Monday a good friend met up with me, we went and picked up the “kit” and a blessedly short while later we were grilling up goodness! 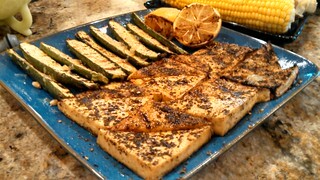 I’m inspired to invite more people over for summer entertaining and I’m already working on a new recipe for Zaatar Grilled Tofu Cutlets with Grilled Lemon! 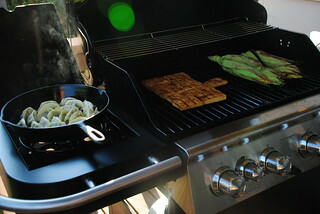 The grill also has a side burner, which makes it even more flexible on those rare, hot summer days. Plus in the event of a major event with the Cascadia subduction zone, we’ve got a good-sized tank of propane and a way to cook! In the meantime, potstickers on a very hot day, no heating up the kitchen.